Our chia seeds are a nutritious, high-energy foodstuff. Chia is a valuable source of fiber, protein, and polyunsaturated fatty acids and therefore particularly useful when dieting. These versatile seeds work wonders in smoothies, yogurt, and salads. Protein. Fiber. Vitamins. Chia has it all. Completely organic and direct from the country of origin. We travelled to Central and South America, the home of the chia plant, to get our hands on organic chia seeds of the highest quality. The history of chia can be traced back as far as the Mayans and Aztecs, who used chia as a source of energy and nutrients for long journeys. There’s no substitute for 5000 years of experience! Nowadays chia is revered for its high fiber, protein, and vitamin content. Traditional nutrition, innovative energy. White chia seeds are rarer than their black counterparts. That's why they’re carefully selected and specially cultivated. The exclusive organic cultivation of our white chia seeds allows us to regulate the quality of the soil and guarantee optimal growing conditions. This in turn helps us to ensure that the seeds maintain their enhanced nutrient profile. A varied and balanced diet and a healthy lifestyle are essential. May contain traces of gluten, egg protein, soy, and milk (incl. lactose). Do not consume more than 15g per day. White chia seeds are very versatile and can be used as a topping on salads, hot dishes, and for breakfast in muesli or yogurt. We recommend a healthy daily portion of about 15 to 30g (1-2 tbsp.). You shouldn’t eat more than 30g a day on a regular basis. Start your day energetic and level-headed by adding a helping of white chia seeds to a satisfying bowl of Protein Porridge, a homemade smoothie, or yogurt. This will supply your body with a healthy mix of high-quality protein, nutrients, fiber and vitamins. Everyone should try the delicious Organic Chia Seeds! Foodspring has really amazed me with the Organic Chia Seeds. I think I will order the Organic Chia Seeds again right now!! I like chia seeds. also good in bakery e.g. pancakes. Can defnitely recommend that product. i like mixing them with oat flakes for overnight oats. -> more protein, less carbs. I love to add white chia seeds to my breakfast foods (yogurt, granola, smoothies). It satisfies my hunger and gives me enough protein in the morning. I never tried white chia seeds before, but I´m totally into them now. Thumps up. Who should use organic white chia seeds? Chia seed is a superfood that combines the best of nature with the knowledge of today. In order to ensure maximised organic quality, foodspring uses carefully selected raw materials from certified, continually monitored areas of cultivation in Peru, Argentina and Mexico. This guarantees a natural product of the highest quality, free of pollutants and harmful pesticides. Complex manufacturing processes with HACCP and ISO certification ensure 100% pure white chia seeds. With a protein content of 20%, chia seeds surpass cereals like wheat and rice. Compared to its little brother flax seed, untreated organic chia seed contains a higher proportion of fibre and the essential vitamins A, B and E. The exceptional nutrient density is supported by a high zinc, iron and potassium content. The use of chia seeds dates back thousands of years to the ancient Aztecs, Inca and Maya who used the seeds to gain strength and endurance on long, arduous journeys. Vegans and followers of raw food diets in particular can benefit from the generous helping of nutrients. And if you avoid gluten and soya, organic chia seeds are an important source of vital substances. It's no wonder that organic chia seeds are marketed as a "superfood". Despite their tiny size - chia seeds are smaller than sesame seeds - these nutritional miracles pack a number of essential and important nutrients. are a source of high-quality vegetable protein. provide you with valuable omega-3 fatty acids. are rich in vitamins, minerals and trace elements. The fibre content in the small miracle grain is high in mucilage, which provides the body with a constant supply of energy over an extended period of time. Just one tablespoon of foodspring's organic white chia seeds covers more than a quarter of your recommended daily intake of fibre. These miracle seeds also contain large amounts of high-quality proteins. On average, chia seeds contain twice as much protein as other grains like wheat, maize, rice or barley. This strengthens and invigorates the entire body. With enough liquid, the gel mass expands in the stomach and slows the release of carbohydrates and fats. The extremely high omega-3 fatty acid content forms an optimised ratio with omega-6 to improve cholesterol and blood lipid levels. 60% of the omega-3 fatty acids form the lipid profile of our organic white chia seeds, making them one of the richest plant-based sources of omega-3 fatty acid. With an extremely high content of antioxidants, the seeds are not only little helpers in the fight against harmful free radicals in the body, they also prevent the oxidation of healthy fats. This contributes to the maintenance and functionality of cells in order to protect against tissue damage and inflammation. With a remarkably high content of more than 40 mg (per 100g) of the vital vitamins A, B and E and minerals of about 2 g (per 100 g), like potassium, iron, zinc and phosphorus, this power grain provides energy all day long. Combined with omega-3 fatty acids, the liposoluble vitamins A, D, E and K can be absorbed more easily and made available to the body. Heat affects the quality of the proteins and nutrients. Low oven temperatures and dehydrators help to get the most out of the nutrients. Organic chia seeds can absorb nine times their weight in water when placed in sufficient liquid. Consider this when soaking the seeds. The organic white chia seeds available for purchase in the foodspring shop enhance any dish without the need for any elaborate preparation. In their natural form or processed into bran, flour or oil - chia seeds are a small all-purpose nutrient with a huge effect. Dried chia seeds are also an ideal topping for side dishes, salads and dressings. In your morning protein porridge, cereal or yogurt these miracle seeds offer an extra nutrient boost to kick-start your day with a long-lasting supply of energy. In their natural form they are suitable as an egg substitute in baked goods. Using them in this way reduces the cholesterol content of whatever you're baking whilst still providing valuable protein. This makes chia seed the perfect egg alternative for vegans. For a bit of comfort food, powdered chia seed is the perfect flour substitute for protein pancakes. Organic chia seeds enhance homemade smoothies with their healthy omega-3 fatty acids, proteins and fibre: One tablespoon of chia seeds turns them into a low-calorie snack which will leave you feeling fuller for longer. Added bonus: The healthy fats help the body absorb the liposoluble vitamins in the smoothie. After exercising you need a lot of protein. When added to whey protein, chia seeds increase the protein content and provide enough fibre and important vitamins and minerals for the perfect post-workout shake. Organic chia seeds are an essential part of a balanced and varied diet, ideal for anyone who is conscious about their health and figure. Vegans and vegetarians in particular can benefit from the high protein content, as a plant-based alternative to meat, fish and other animal products. Chia seeds make the perfect natural food supplement for people who regularly engage in strenuous physical activities or exercise. Unlike oatmeal and even whole grain, which provides quick energy but is also consumed relatively quickly, organic chia seeds slow down the breakdown of carbohydrates. The slow breakdown of carbohydrates ensures that endurance athletes, like marathon runners, are supplied with sufficient energy over the entire course of their run, which prevents premature dips in performance. 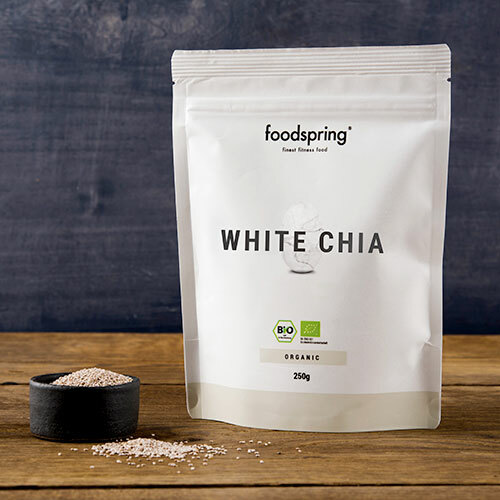 Not only that: Anyone looking for protein-rich, low-calorie foods as part of a weight loss regime should look no further than organic white chia seeds by foodspring. They are just what you need for weight loss. We have compiled everything you need to know about how chia seeds can be used for weight loss. If you follow a gluten-free diet, you can use organic chia seeds to supplement your diet. Generally speaking, high-quality organic chia seeds can be identified through the consistent absence of artificial ripening techniques, chemical treatment processes and additives. You should take these quality criteria into careful consideration when purchasing chia seeds, especially when shopping online. Chia plants from conventional agricultural cultivation often contain a number of toxins. Crops are often planted extremely close together and fertilisers and pesticides are used in order to achieve the highest possible yield. The plants end up storing these toxins. This has a negative effect on the quality of the nutrient density. What's more, traces of pesticides can remain in food even after thorough cleaning. Regular quality control and reliable organic certification guarantee a perfect chia seed product with optimised nutrient density and efficacy. Certified organic raw materials guarantee perfect, unprocessed, odourless chia seeds in the best raw food quality. Buy 100% pure, white chia seeds in organic quality, with valuable nutrients right here in our online shop. What essential nutrients do white chia seeds provide? White chia seeds are an absolute miracle food. They provide you with high-quality plant protein and valuable omega-3 fatty acids and are also rich in fiber. What’s the best way to use white chia seeds? Most people typically add white chia seeds to yogurt, smoothies, or salads. You can enhance so many foods with this nutritional ingredient! What does “organic quality” white chia seeds even mean? When we say “organic quality,” we mean that our white chia seeds have no additives and are not processed with chemical fertilizers or pesticides during cultivation. How are your organic chia seeds processed? The main part of the production process involves thoroughly cleaning the seeds. With a specially designed horizontal sieve cleaning method, we can produce extremely pure chia seeds that preserve the seed’s full nutritional value. We ensure that we have 100% pure white chia seeds using visual sorting methods. White Chia Seeds will be back in stock shortly.